The first two are Papyrus deckle edged writing sheet sets, next is a CR Gibson open stock stationery set and last is a notepad from Franklin-Christoph. I got a blue and a white set. The set includes 100 sheets and 50 envelopes. The edges of the paper and envelopes are frayed looking which is the "deckle edge", a term I never heard before. The sheets are 6 3/4 X 9 1/2 inches. This is a sturdy but thin paper. It feels like quality parchment but is much thinner. It takes fountain pen ink well. I have no issues with smearing. There is no feathering no bleedthrough. The paper is thin. I had no trouble writing on both sides. But if you hold the paper up to read the letter you can see the words on the back side. On a flat surface this is not a problem. All of the letters I have sent were written on both sides. I really like this paper and recommend it. This is the CR Gibson. It is available at CR Gibson Website for $12.50. ML purchased it in a stationery store and around here it is readily available. 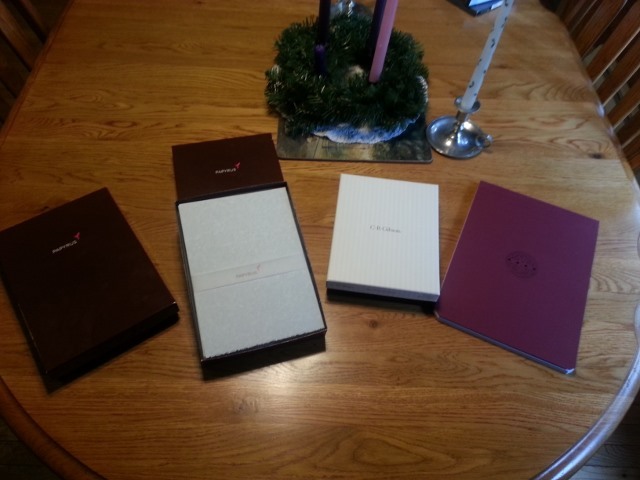 The set includes 50 sheets and 25 envelopes. The sheets are 6 X 8 inches. 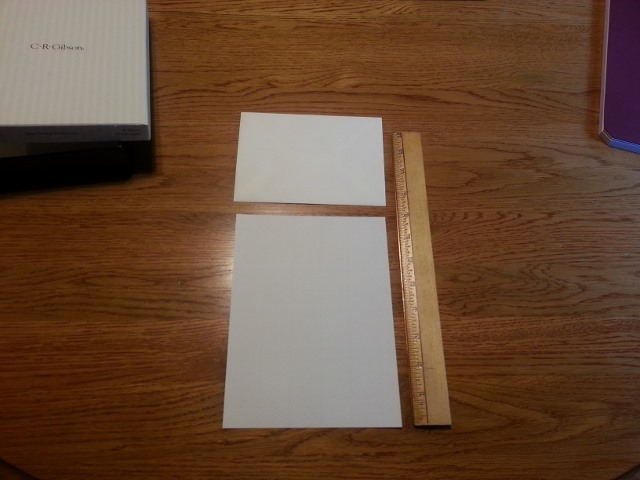 The paper is thick. It looks elegant. It takes ink well except for a curious oddity. Every once in a while the pen hits a spot where you suddenly get feathering. I have used this stationery before and the intermittent feathering always happens. Other than this the paper is very nice to write with. The feathering, while noticeable, does not effect legibility. Bleedthough is not an issue. Nor is writing on the back side of the page. Based on the feathering and the costs I prefer the Papyrus. This is the Franklin Christoph A4 note pad available at Franklin Christoph for $12. It comes in an 80 sheet micro-perforated pad. 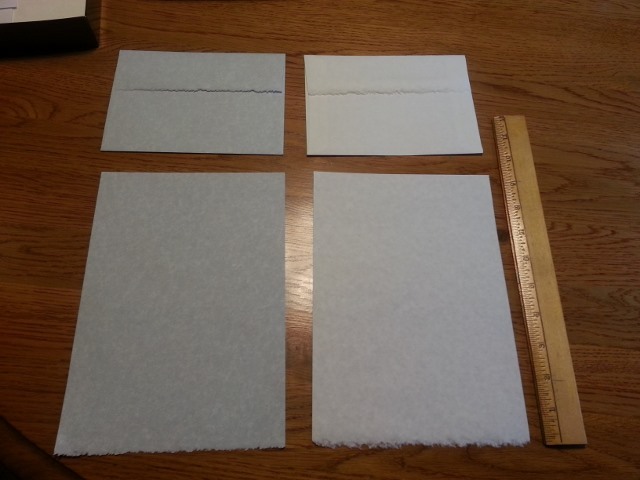 The sheets are 8 1/4 X 11 3/4 inches with the truncated corners as shown. FC lists it as a 90 gram paper. It has a heavy stock cover with creases that make it possible to fold the cover completely pack for use as a steno pad. The paper has an ever so faint pink tint. (It looks great with Diamine Oxblood ink). This paper is great. No smearing, feathering nor bleedthrough. I really like it and will be purchasing more. I would put it on par with the Rhodia Premium/Clairefontaine Triomphe paper. I do have one small quibble. 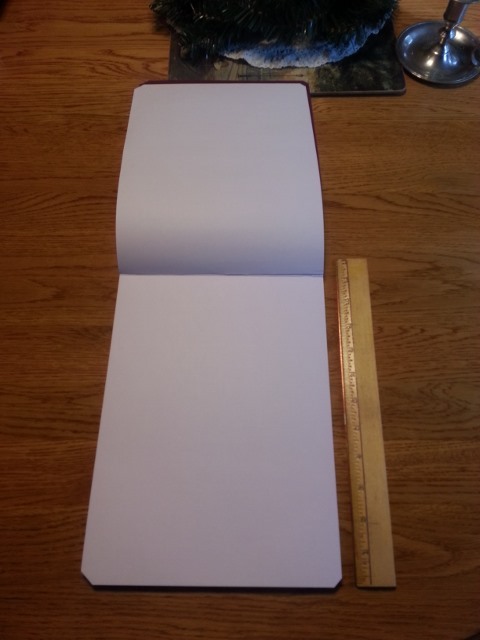 The microperfs are not nearly as small as the Rhodia/Clairefontaine. On those you can hardly tell that a single sheet had perforations. They are plainly obvious on the FC paper. But I still like the paper. Phil, that is a superb review of those papers. 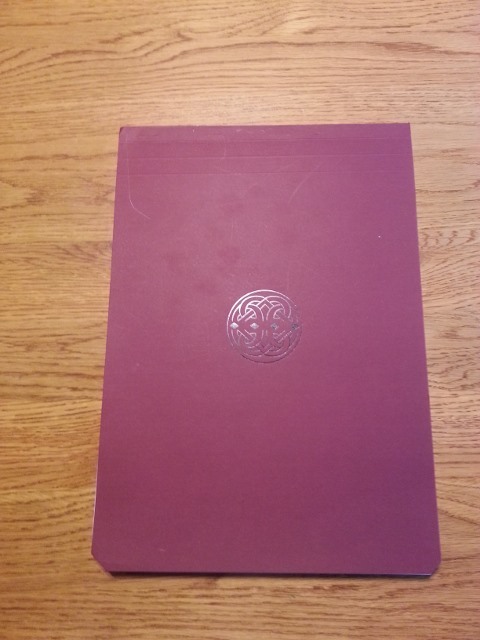 The Papyrus Deckle Edge looks beautiful and at the 2-for-1 price is a good deal. Use them in the best of health. Thanks for the review, Phil!